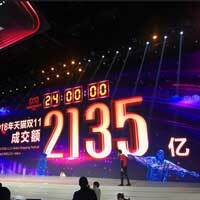 Alibaba’s Singles’ Day smashes records with over $30bn in sales. Alibaba reported a record RMB213.5 billion (US$30.8 billion) of gross merchandise volume (GMV) for the 24-hour period, which was an increase of 27% on the same promotional day last year. Despite the annual growth slowing from last year’s 39%, it still put other single-day promotion events in the shade. The figures include orders settled on its online payments service Alipay across its various online retail services such as AliExpress and Taobao. The boost in sales also comes as Alibaba included revenues from Lazada, an e-commerce service operating in Southeast Asia owned by the company. Singles Day (November 11) was originally created as a student holiday in China to celebrate single people. Alibaba turned it into an online-shopping festival in 2009, and now it’s the world’s largest online-shopping festival, outstripping traditional American shopping holidays.